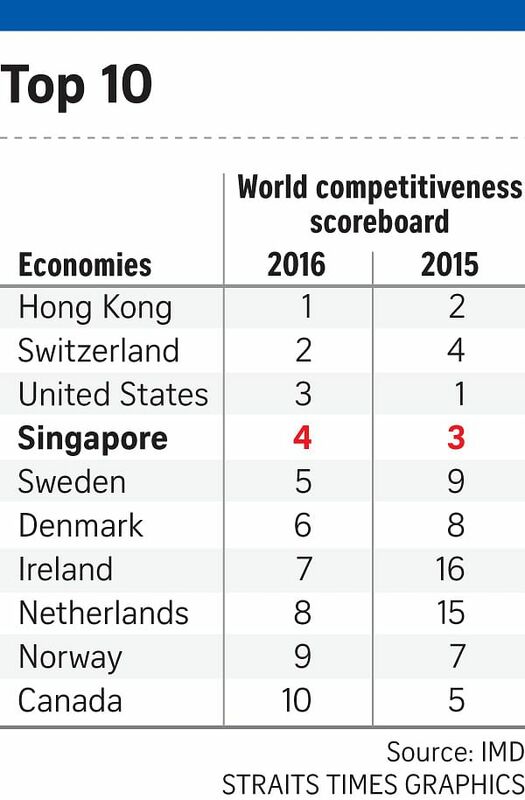 Singapore has slipped one spot to be ranked the world's fourth most competitive economy, dragged a little lower by a weak global economy and relatively slow progress of economic restructuring at home. However, observers noted that the Republic retains an enviably high competitiveness ranking. Hong Kong took the top spot in this year's ranking by the IMD World Competitiveness Centre yesterday, up from No. 2 last year. It took over the No. 1 spot from the US, which slipped to third this year, while Switzerland moved up two places from fourth to second. By phone from Lausanne, Switzerland, Dr Christos Cabolis, chief economist at the IMD World Competitiveness Centre, said: "There have been significant improvements made by Hong Kong and Switzerland in 2015, which have not impacted Singapore. It is just a fact they have done better. "Also, the economic performance of Singapore has deteriorated. There are two indications: the lower growth of the economy and a perception the Singapore economy is not as resilient as it used to be." He noted warning signs of a lack of diversification in Singapore, and that it is surrounded by countries in a productive and reforming mode. "Singapore is a successful economy but it should not be complacent. It also cannot ignore its neighbours' problems. Asia, and South-east Asia in particular, has suffered a lot this year, primarily due to (slowing) China and oil prices," Dr Cabolis added. OCBC economist Selena Ling said the deterioration here has probably been in the making for a few years, "given that the global economy has been softer than expected and the increasingly apparent domestic cost and productivity challenges during our economic restructuring". However, she said that the fact another small open Asian economy - Hong Kong - has outdone the US and Switzerland "means it would not be totally accurate to say Singapore's slide was 100 per cent externally driven, even though China's slowdown and the commodities drag on our key trading partners, like Malaysia and Indonesia, did play a part". The ranking also showed Taiwan, Malaysia, South Korea and Indonesia all suffered significant falls from last year. Professor Arturo Bris, the centre's director, said: "On the whole, there has been a significant drop in Asia's competitiveness since our last ranking. This general decline has been caused by the fall in commodity prices, a strong dollar and the deterioration of balance sheets in both the private and public sectors." The centre analyses over 340 criteria across four main factors - economic performance, government efficiency, business efficiency and infrastructure. IMD, a top Swiss business school, also surveyed over 5,400 business executives. Ms Ling said: "Looking ahead, market expectation is also building for the Committee on the Future Economy to help drive some of the medium-term economic strategies."